Home TravelAirlines How Does Gulf Air’s Short Haul Business Class Stack Up Against ME Carriers? How Does Gulf Air’s Short Haul Business Class Stack Up Against ME Carriers? Heading off on our first visit to Bahrain, it seemed appropriate that Gulf Air, the national carrier of the kingdom, should be the one to take us there. We’re rather used to flying Emirates Business both long and short haul so we’re curious to see how this Middle Eastern carrier compares to the DXB behemoth. Gulf Air operates out of the much less glamorous T1 as opposed to the Emirates-only T3, and ‘much less glamorous’ soon becomes the theme throughout our Gulf Air experience. The Gulf Air lounge that accompanies your business class seat is fairly standard, with a reasonable range of food and alcohol on offer. However, if you have Lounge Key access with your credit card you’d be much better off going to the Skyteam lounge down the hall which has a superior selection of wines. We’re flying on the A320-200 as it’s just a short flight, much like Dubai to Oman. But after seeing what Emirates can do to impress in that quick journey, it quickly becomes apparent that Gulf Air simply doesn’t compare. 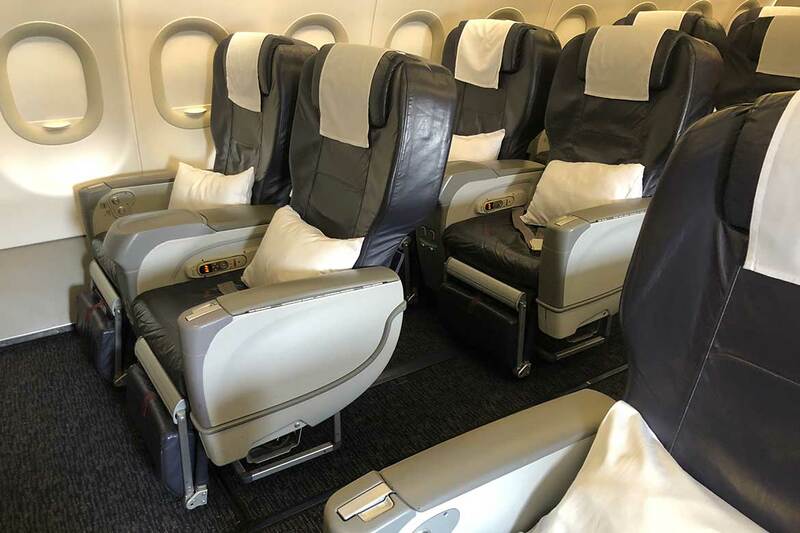 We estimate the plane fit out would be at least 10 years old (likely more), with the old school leather business class seats with fold down metal foot rest that were historically used on short haul flights, but they are comfy enough with plenty of legroom. From the moment the pre-flight service starts, the difference between Gulf Air and Emirates as distinct as the gulf between the cultures of the two destinations. The first thing we notice is that the pre-flight drink service is missing the most iconic perk of flying business – the welcome Champagne. Water, orange juice or lemon mint are on offer, followed by a service of dates and Arabic coffee. We’re not sure why we were so surprised to see this, given that it is an Arabic airline, but it really did seem out of place given the offerings of the other Middle Eastern carriers. Paired with the newspaper service, we really felt like we were in a time warp – it’s all trés 80s. 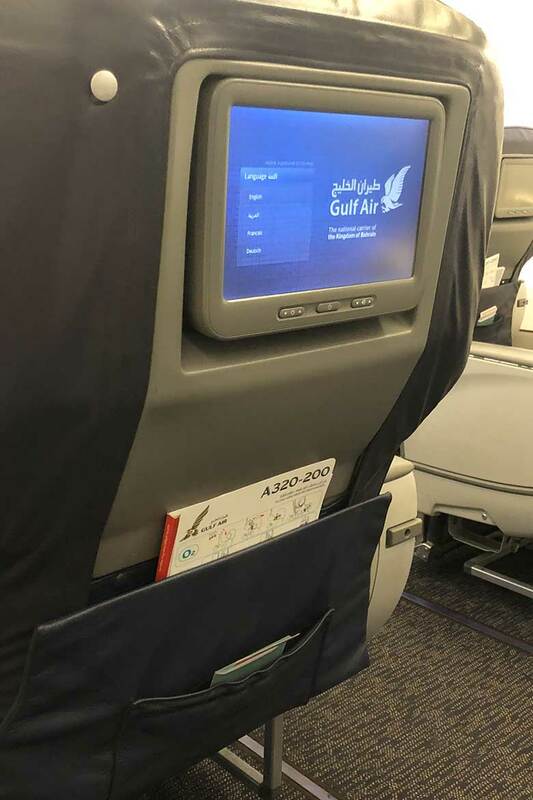 The IFE is extremely limited – the TV channels offered were: Islamic programs, Cartoon Network, Sesame Street, CBS, Khaleeji TV, Sony, Gags TV, BBC and Fox. We tried to check out the movie selection, but when we wanted to see what ‘new Hollywood’ movies were offered, we were given an error message saying, ‘Currently the service is blocked’. We could however access Arabic and Hindi movies, so we’re not sure whether this is a system error or some strange form of censorship. (Surely you could just remove the category altogether if that’s what you wanted?) The screen is small even by economy standards, however, so we’re not sure why you’d really want to bother with it anyway. You won’t find the usual Emirates amenities on your seat such as blanket, water bottle and headphones – if you want headphones, you’ll need to request them from the cabin crew. 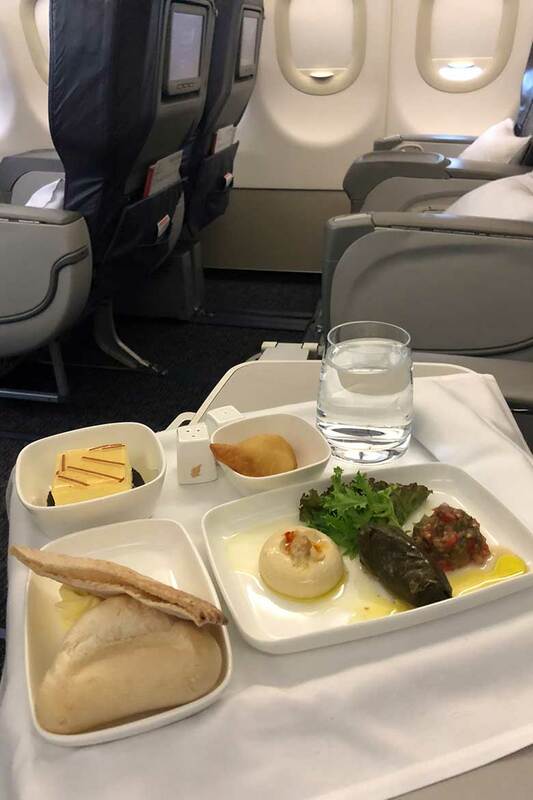 There was no menu provided on board but we were offered a choice of a hot snack – described as fish, chicken and vegetables (yes, that’s all one dish – fish and chicken together…) or Arabic mezze, which we opted for. As if fish and chicken wasn’t a strange enough combination, the smell of the fish stank out the entire cabin for the remainder of the flight in a rather unpleasant fashion. When the food arrived, however, it was presented nicely. The bread offered was warm, and the mezze, consisting of hummus, moutabal, a stuffed vine leaf and a cheese filled pastry, was not bad at all (the dessert, on the other hand.…). We enquired as to whether they served alcohol as it wasn’t offered, and it seems if you ask nicely they’ll rummage behind the curtain and sneak some out for you. There’s no wine list, rather it’s a choice of red or white, and no bottle presented so we’ll have to take a stab in the dark at what our Chardonnay was. Judging by the taste we’d say fairly average (and room temperature) French plonk. We were offered a refill though (and this time poured at the seat) which was appreciated – sadly we didn’t manage to get a clear view of the label. Service was the best feature of our Gulf Air flight by far. The staff were pleasant and helpful, even offering to put our wine in a paper cup for landing – adorable. There were two cabin crew looking after the six passengers in business (the capacity is 16) so they definitely weren’t overrun – but nonetheless the service felt genuine and attentive. Would we fly Gulf Air again? Whilst we’d be interested in seeing what their long haul service has to offer, for short haul Middle East flights on planes such as the A320, it’s a resounding no. The Emirates offering is such a superior product that it’s simply night and day. This is a business class that sadly feels dated, lacks the luxury of J class and for a short flight, whilst it is worth noting that it is definitely cheaper than the ME three, just isn’t worth paying the extra upgrade cost for in our books.